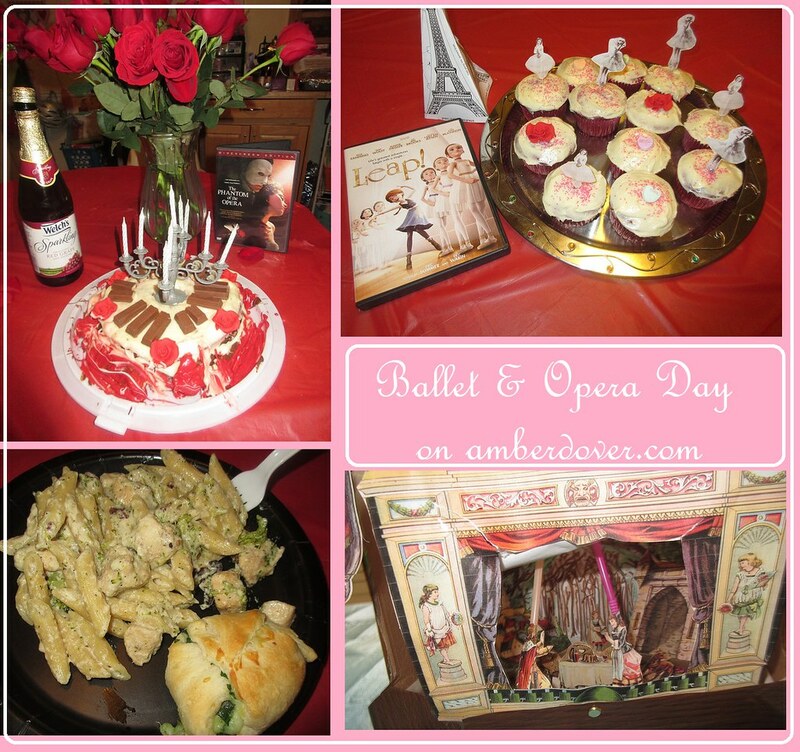 In this post: Two random February holidays: Ballet and Opera Day. Yummy treats, fun movies, and elegant crafts. Hello, Dear Ones! As you can see I’m really trying to flood you with inspiration to make up for my hiatus. I so appreciate your support in keeping this blog going. Our family has had some major things happening. Maybe I can share later. For now, please keep us in your prayers. Moving on…so if you follow my blog you know I love holidays…especially random holidays. We started celebrating random January holidays but I decided to branch out to other months. February has several romantic and artsy holidays besides Valentines…like Fairy Tale Day. My two favorite were Ballet Day and Opera Day. Ballet Day- I actually was a ballerina during my senior year of high school. It was a short stint but I’m glad I was able to become something I always wanted to be. I’m in the process of making a shadow box with my ballet slippers. I’ll update this post when I make it. Food and Fun: We watched the movie Leap!, which is a sweet story about an orphan who trains to become the top ballerina. So my older guys weren’t into this but Leeland loved the ballerinas and so did I. Michael cut out and folded a mini Eiffel Tower (the movie takes place in France). We ate red velvet ballerina cupcakes. Ballerina cupcakes– So I keep it simple and make box cakes. Red velvet is a favorite of ours with cream cheese frosting. The pink sprinkles, candy roses, and candy hearts added that girly flair. I found vintage ballerinas on Pinterest, printed them out, and taped them to tooth pics. I would’ve gone wild if my mom had made these when I was a little girl. The fun part is that you can play with these paper ballerinas after you eat the cake! Leeland’s ballerina decided to dance on the Eiffel Tower. Opera Day- As a teen, I went on a stateside missions trip. The host mom that I stayed with had a convertible and she loved Charlotte Church’s opera. I remember listening to Charlotte Church while the top was down as we rode through the Kentucky hills. I fell in love with Opera that day. Later I saw Phantom of the Opera and loved it. Then there’s the opera scene in Life is Beautiful. Josh Groban and Andrea Bocelli…it’s like food for the soul. I come from a musical family. I love all genres but Opera is like a delicacy. To celebrate, we enjoyed the movie The Phantom of the Opera and a yummy opera cake inspired by the movie. I also made a paper Opera theater with paper dolls. Opera Cake- I made the layers with inspiration from here and the design from here. I’m not a cake artist. I added some crunchy layers of wafer cookies since opera cakes have layers. I added candy roses. Kit Kats made the piano keys. You’ve seen the candelabra before. They don’t cost much at Walmart. I was happy with the look…especially with my limited experience decorating cakes. Here you can see the layers of the cake before I iced it all the way. The one issue is that this cake has to be eaten quickly. The candy and wafers get too moist or stale over a day. The covering didn’t do much for it. So I found these images on Pinterest. Some are vintage. I did not draw any of these. I just cut them out for personal use. I glued the theater to a cardboard box and the paper dolls to file folders and cardboard. I taped some of the dolls to straws so they could be used in the theater. I love how the curtain rolls up by attaching it to a brad. Not all of the images go together. I mixed and matched them. The vintage ballerinas are the ones I used on the cupcakes earlier. I colored a forest scene and glued it inside for the backdrop. It looks great with my fairy tale puppets. There’s also a couple castles. I did an extra pull out for the Phantom of the Opera dolls (again found on Pinterest). I used Victorian props for them. I used contact paper with a wood grain for the walls and a marble look for the floor. This is similar to Beast’s library that I made for Fairy Tale Day. A Fancy Dinner- The hubby and I worked together to make a fancy romantic meal. It’s a great choice for either day.